Chanute has been exploring available options for a citywide FTTH network. In addition to offering residential service, city leaders want to expand the business use of its municipal fiber network. A limited number of businesses currently join schools, government, and utilities on the fiber infrastructure. The community incrementally built a fiber network to serve government, utilities, and schools with no borrowing or bonding. The broadband utility continues to expand and uses WiMAX for public safety and to connect several businesses. For the full story of this central Kansas community, download our case study Chanute’s Gig: One Rural Kansas Community’s Tradition of Innovation Led to a Gigabit and Ubiquitous Wireless Coverage. When complete, the city system will offer service at a speed of one gigabit per second. City residents will pay $40 a month; it will cost $50 outside the city limits and $75 for businesses. To put that in perspective, Chanute will offer the same ultra-fast connection speed as the Google Fiber system being rolled out across the Kansas City metropolitan area, but 42 percent cheaper than Google’s $70-a-month charge. Or, to use another comparison, Chanute’s fiber-to-home system will be 14 times faster and cost 60 percent less than the best Internet service the town’s residents can get today. Wow! And recall that this would not be possible if the cable lobbyists had their way earlier this year in the Kansas legislature. Kansas briefly considered making it impossible for communities to build their own networks and will likely take up the matter again next year. Kevin Litten, of the Baltimore Business Journal has published a good discussion of why Baltimore is considering a public investment to expand the City's fiber network. At No Inc., a 10-employee tech firm that develops software for commercial real estate, Chief Technology Officer Alex Markson said that Comcast wanted to charge $20,000 to build infrastructure to the company’s small office building on Water Street downtown. The company had to settle for an affordable, but vastly inferior wireless connection from Clear using WiMAX. Keep this in mind the next time you hear that wireless is providing an alternative to the cable and telephone monopolies. But that setup, which includes a barbecue grill-like satellite dish pointed out the window of the company’s offices, isn’t ideal. Productivity plummets when employees have to wait for long downloads. When using technology such as GoToMeeting to make sales pitches, “you’re not crushing it because you look like you’re slow,” Markson said. Clearwire, which brags that it built the first 4G network in the country, is under assault from its customers. Customers began complaining in mid-2010 that Clearwire had begun to throttle their home Internet connections, sometimes as slow as 256Kbps. It wasn't clear (ba-dum ching) at the time as to what standard Clearwire was using in order to trigger the throttling—some users were told about monthly usage caps while others were simply told that there were certain times of day in which the network would be congested. Customers were frustrated at this lack of transparency, and complaints began piling up all over the Web. We were told for years that WiMax would obviate the need for last-mile wired connections. Now we are told that 4G LTE will solve those problems - and gullible reporters gush about how fast their connections are in these early days as the network is built. This is akin to driving on a metro interstate at 3AM and wondering why anyone would ever complain about rush hour traffic. 4G networks will likely be much better than 3G (it is a higher number, after all) but it remains to be seen how well they perform in real world conditions when many devices can actually attach and congest them. We remain skeptical of wireless as a solution to last-mile problems. Wireless does little more than take a high-capacity wired connection and split it among hundreds or thousands of users - while reducing its reliability. 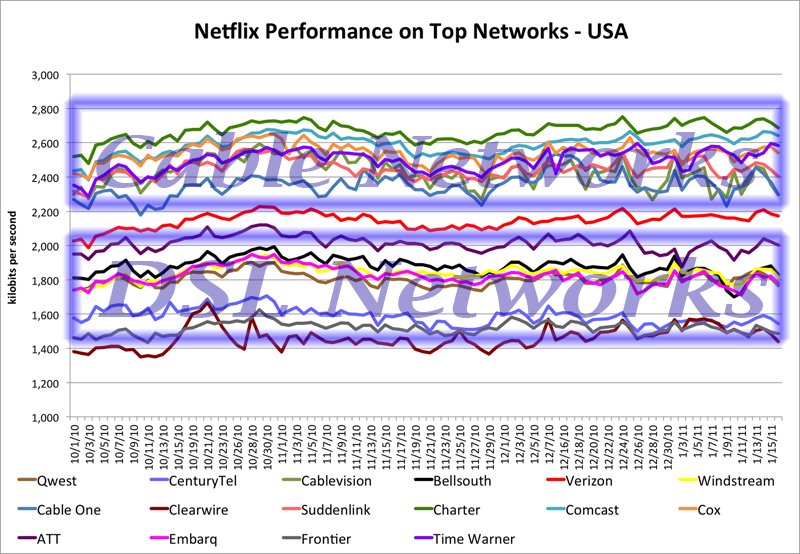 The Netflix Techblog has released a graph of performance by Internet Service Provider - which I modified to demonstrate the Looming cable monopoly as identified by Susan Crawford (and recently discussed here by Mitch Shapiro). The trend is unmistakable. There are 2 distinct groupings - the cable providers all beat the DSL providers (Verizon is in the middle, likely due to its fast FiOS speeds averaging with much slower DSL connections). At the very bottom is Clear's 4G WiMax - you know, the superfast wireless that is the key to fast broadband! Communities need to read this chart and take a lesson: the future of broadband is not pretty if you do not have a network that puts your needs first. Cable broadband speeds are increasingly more rapidly than DSL, meaning a local monopoly on high speed broadband, with DSL slowly becoming the modern dial-up. Salisbury, a community in North Carolina building a city-owned full fiber-to-the-home network, has run into an unexpected difficulty: naming the new network. To put it simply, all the good names are taken. Mike Crowell, director of broadband services — he jokes that he is the director of BS — says the city can't find a name that it can both trademark and get a domain name for. In coming weeks, the city will be purchasing and outfitting a marketing trailer, which it can send into neighborhoods and to community events to explain the new cable utility and get people excited about what's around the bend. The trailer will be plastered, of course, with the system's chosen name. This is a great marketing method - particularly if the trailer has computers showing what is possible with the new network in direct comparison to existing offers. Wilson's Greenlight Network also used this approach and reported that it was very successful. South Carolina was unique in being the only state where the public controlled the spectrum available for WiMax and could have built a state-wide broadband network. Instead, they chose to sell it off to the private sector for a pittance. Pennington spoke about a proposed broadband initiative he is pushing that would enable the city to create a fiber optic network and offer broadband services such as high speed internet, cable television and digital telephone service to city residents and businesses.